This article is about the corporation formerly known as France Télécom. For the former UK mobile phone operator, see Orange UK. Orange S.A., formerly France Télécom S.A., is a French multinational telecommunications corporation. It has 256 million customers worldwide and employs 95,000 people in France, and 59,000 elsewhere. It is the twelfth largest mobile network operator in the world and the fourth largest in Europe after Vodafone, Telefónica and VEON. In 2015, the group had revenue of €40 billion. The company's head office is located in the 15th arrondissement of Paris. The current CEO is Stéphane Richard. The company is a component of the Euro Stoxx 50 stock market index. Orange has been the company's main brand for mobile, landline, internet and IPTV services since 2006. It originated in 1994 when Hutchison Whampoa acquired a controlling stake in Microtel Communications during the early 1990s and rebranded it as "Orange". It became a subsidiary of Mannesmann in 1999 and was acquired by France Télécom in 2000. The company was rebranded as Orange in July 2013. In 1878, after the invention of the electrical telegraph and then the invention of the telephone, the French State created a Ministry of Posts and Telegraphs. Telephone Services were added to the ministry when they were nationalised in 1889. However, it was not until 1923 that the second 'T' (for 'telephones') appeared and the department of P&T became PTT. In 1941, a General Direction of Telecommunications was created within this ministry. Then, in 1944, the National Centre of Telecommunications Studies (CNET) was created to develop the telecommunications industry in France. In the 1970s, France tried extra hard to make up its delay on other countries with the programme "delta LP" (increasing the main lines). It was at the time when the majority of the local loop was built; that is all the cables linking the users to the operator. Moreover, with the help of French manufacturers, digital switching, the Minitel and the GSM standard were invented by engineers and CNET researchers. In 1982, Telecom introduced Minitel online ordering for its customers. Until 1988, France Télécom was known as the direction générale des Télécommunications, a division of the Ministry of Posts and Telecommunications. It became autonomous in 1990. This was in response to a European directive, aimed at making competition mandatory in public services from 1 January 1998. The 2 July 1990 Bill changed France Télécom into an operator of public law, with Marcel Roulet the first Chairman. Since then, the company has had a separate body corporate from the State and acquired financial autonomy. It was privatised by Lionel Jospin's Plural Left government starting on 1 January 1998. The French government, both directly and through its holding company ERAP, continues to hold a stake of almost 27% in the company. In addition, the government Conseil of Ministers names the CEO. In September 1995, Michel Bon was appointed to run France Télécom Group. In 1997, the capital of the new public company was successfully floated whereas the dot-com bubble phenomenon made the stock exchanges bullish. A second share offering occurred in 1998. France Télécom got behind in the internationalization launched by its international competitors such as Vodafone, thus, it started looking for targets at the highest speculation rate of the dot-com bubble. Moreover, its alliance with Deutsche Telekom based on a reciprocal capital contribution of 2% broke off when Deutsche Telekom announced that they were planning to do business with Telecom Italia without letting the French know – even if this project ended up failing. In July 1991, Hutchison Telecom, a UK subsidiary of the Hong Kong-based conglomerate Hutchison Whampoa, acquired a controlling stake in Microtel Communications Ltd, who by then had acquired a licence to develop a mobile network in the United Kingdom. Hutchison renamed Microtel to Orange Personal Communications Services Ltd, and on 28 April 1994 the Orange brand was launched in the UK mobile phone market. A holding company structure was adopted in 1995 with the establishment of Orange plc. In April 1996, Orange went public and floated on the London Stock Exchange and NASDAQ, majority owned by Hutchison (48.22%), followed by BAe (21.1%). In June 1996, it became the youngest company to enter the FTSE 100, valued at £2.4 billion. In October 1999 the German conglomerate Mannesmann AG acquired Orange for a price equivalent to €7,900 per customer, i.e. US$33 billion. Mannesmann's acquisition of Orange triggered Vodafone to make a hostile takeover bid for Mannesmann. Shortly thereafter, in February 2000, Vodafone acquired Mannesmann for US$183 billion, and decided to divest Orange because the EU regulations wouldn't allow it to hold two mobile licences. In August 2000, France Télécom bought Orange plc from Vodafone for a total estimated cost of €39.7 billion. At the time, France Télécom also bought stakes in several other international firms (GlobalOne, Equant, Internet Telecom, Freeserve, EresMas, NTL, Mobilcom), of which some have since been sold back. Through this process, France Télécom became the fourth biggest global operator. The mobile telephone operations of Orange plc were merged with the majority of the mobile operations of France Télécom, forming the new group Orange SA. On 13 February 2001, Orange SA was listed on the Euronext Paris stock exchange with an initial public offering of 95 Euros per share, with a secondary listing in London. In May 2001, Orange SA was listed on the CAC 40, the benchmark stock market index of the top 40 French companies in terms of market capitalisation. In June 2001 the France Telecom Mobile brands Itinéris, OLA, and Mobicarte were replaced by the Orange brand. On 21 November 2003, France Telecom withdrew the 13.7% of Orange's shares traded on the Paris stock exchange. On 2 October 2002, the CEO, Thierry Breton was given the task of turning the company around after the company became crippled by debt following the drop of the company's stock price. On 30 September 2002, the company's stock price was €6.94, down from €219 on 2 March 2000. France Télécom was the second most indebted company worldwide in terms of short-term liabilities. The company obtained 15 billion of debt adjustment that needed to be borne by banks and investors, another 15 billion as a capital increase from the French State since it was still the majority shareholder, and an additional 15 billion in cash from internal savings. 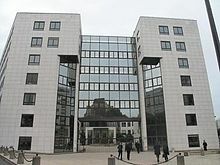 On 25 February 2005, Thierry Breton was appointed Minister of Finance and Industry and Didier Lombard, who had been head of the firm's new technologies division, replaced him as CEO. Logo of France Télécom from 2006 until 2013. The NeXT scheme was the recovery plan for France Télécom which aimed at, among other things, reducing costs, especially wage costs, carrying on a converging policy for its products and services, and grouping together all the brands under a single brand, except for the activities dealing with fixed line telephone which would stay under the designation 'France Télécom'. Consequently, this led to the disappearance of a number of brands. From 1 June 2006, France Télécom tried to commercialize all its products under a single worldwide brand, becoming the sole brand of the France Telecom group for Internet, television and mobile services in the majority of countries in which Orange operated. Orange Business Services became the brand for all its business services offerings worldwide, replacing the Equant brand. In June 2007, Orange and Mid Europa Partners acquire Austrian mobile network company One, re-branding it as Orange Austria. In 2012 this network is sold to Hutchison 3G and the Orange Austria brand was terminated. In November 2008, Orange launched five Orange Cinema Series channels. To do so, Orange bought the exclusive rights from Warner Bros.. for first runs of all new films, previously held by TPS Star (a subsidiary of the Canal+ Group), as well as all films in its catalogue and rights to the film catalogues of Gaumont, HBO and MGM. Orange also secured exclusive rights to broadcast Saturday evening Ligue 1 football matches from the French Football Federation. SFR (a subsidiary of Canal +). Free accuses Orange of tied-selling because the Orange channels are only available to its subscribers. In June 2008, the firm abandoned a €27 billion bid for Swedish operator TeliaSonera after the two companies failed to agree terms. In 2008, Orange was given permission from Apple to sell the iPhone in Austria, Belgium, the Dominican Republic, Egypt, Jordan, Poland, Portugal, Romania, Slovakia, Switzerland and Orange's African markets. On 8 September 2009, Orange and T-Mobile parent Deutsche Telekom announced they were in advanced talks to merge their UK operations to create the largest mobile operator with 37% of the market. Both T-Mobile and Orange brands will be kept due to the differences in targeted market. T-Mobile will remain the budget conscious offering and Orange the premium one although there is some overlap as of February 2011. On 5 April 2009, Orange won an Arbitration Court case against Orascom Telecom, forcing Orascom to transfer its stake in Mobinil to Orange at a price of E£441,658 per Mobinil share. On 28 October 2009 Orange changed the name of its Luxembourgish telecommunication company VOXMobile to Orange. On 5 November 2009 Orange Armenia, 100% subsidiary of France Telecom, launched telecommunication services in Armenia. On 11 December 2009 Egypt's regulator approved an offer from a unit of France Telecom (Orange) to buy Mobinil. In 2010 Orange changes CEO. Didier Lombard is replaced by Stéphane Richard. The company is also reorganised internally, most notably with the arrival of former Culture Minister Christine Albanel as head of communications for the group. In mid-April 2010 Orange UK announced that it would outsource the management of its broadband network to BT. This announcement was greeted positively by broadband commentators, who felt that the move was likely to improve Orange's broadband quality and customer services. On 2 March 2012, Didier Lombard, who remained special advisor to Stéphane Richard, left the company. His departure was shadowed by controversy over his stock options: he was suspected of having stayed with the company longer to wait for the France Telecom share to recover and then exercise his stock option. The share was trading at around €16, whereas his stock options were at €23. On 3 February 2012, Hutchison Whampoa announced that it would buy Orange Austria for US$1.7 billion. The deal closed on 3 January 2013, and the Orange brand was phased out on 19 August 2013, when its operations were merged into 3. In March 2012, France Télécom bought 93.9 percent of Mobinil, an Egyptian mobile operator, from Naguib Sawiris's Orascom Telecom Media and Technology (OTMT) in an effort to double its revenue in MENA by 2015. On 28 May 2013 at the Annual Shareholders' Meeting, shareholders approved changing the name of the group to Orange S.A. This became effective on 1 July 2013. In September 2014, Orange agreed a deal to acquire Spanish firm Jazztel for a fee of around €3.4 billion. As of October 2018, Orange has teamed up with Google in order to create a transatlantic undersea cable to share data between the United States and France at faster speeds. 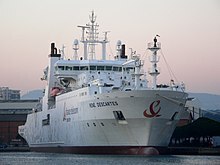 Planned to begin operation in 2020, the cable is purported to transfer information at rates "more than 30 terabits per second, per [fibre] pair". The cable will span approximately 6600 kilometers in length. The major shareholders of Orange as of 31 December 2015 are the state of France through Agence des participations de l'État and Banque publique d'investissement (replacing Fonds stratégique d'investissement) for 23.04%. As in mid-2013, Orange employees, who own 4.81%, and the company itself, who own 0.58%. France, Romania and Slovakia: leading mobile telephone business. Belgium, Poland: ranked 2nd in mobile telephony. Spain: ranked 3rd in mobile telephony. Orange is the sole brand used in the marketing of the company's mobile offers; the Itineris, Ola and Mobicarte brands have been combined since 2001, and Mobicarte became a special prepaid calling offer. As of 31 December 2010, Orange has 150 million mobile customers worldwide, 17.9% of whom are in France. Orange France is the leading mobile telecommunications operator in France, with a market share of 45.38% as of 2 November 2009. Orange took over the landline and Internet businesses of France Telecom and Wanadoo in 2006. Since then, Orange is the sole brand of France Telecom for landline and Internet services worldwide, with a few exceptions, such as Mobistar in Belgium and TPSA in Poland. Orange's triple-play broadband Internet offers are supplied through the Livebox. 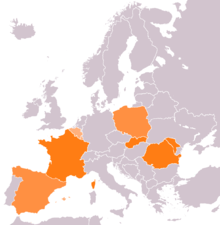 As of 31 December 2010, Orange has 13.7 million broadband ADSL customers worldwide, 67% of whom are in France40. The Livebox is the ADSL modem supplied to Orange's ADSL and FTTH customers in France, the United Kingdom, the Netherlands, Switzerland, Spain and Tunisia, and to WiMAX customers in Cameroon. It serves as a bridge between the Internet access and the home network through several communication interfaces (Bluetooth, Ethernet, Wi-Fi). The Livebox has evolved over time. The Livebox 1.0 was replaced by version 1.1, the Mini Livebox, followed by the Livebox 2.0. The newest version was scheduled to be rolled out 2012 41. The Livebox is offered on a monthly contract for €3 per month or for purchase for €59. Number of Liveboxes rented in 2008: 7.3 million, a 12.3% increase in one year. Beginning in 2003, Orange's strategy has centred on the acquisition, creation and diffusion of content. This starts with the creation of MaLigne.tv in 2003, later renamed Orange TV, an ADSL television access service and a video on demand service. In 2004, Orange organises a television access service for mobile phones. In 2007, Orange creates Studio 37 [fr] and, in 2008, enters into a partnership with France Televisions to broadcast pre-recorded programming from the public national television and to roll out theme channels for sports, cinema and television series. Dubbed Content Everywhere in 2008, the content access strategy is announced simultaneously with the launch of the Orange cinema series television channels, and aims to offer customers access to all of the company's content, anywhere and from any device. Orange Cinema Series is launched 13 November 2008, along with Orange Sport; it comprises five channels devoted to movies (Orange Ciné Max, Ciné Happy, Ciné Choc, Ciné Novo, Ciné Géant). The channels primarily show films from the Warner Bros. and HBO catalogues. Orange installs additional VOD services on its channels, allowing viewers to watch programmes broadcast in the previous 30 days whenever they like, as well as supplementary programmes from the previous month. Orange Sport is launched 13 November 2008. Orange secures the broadcast rights for the Saturday evening lineup of Ligue 1 matches from season 2008/2009 to season 2011/2012, and the rights to home matches of eight Serie A clubs (U.C. Sampdoria, Atalanta B.C., A.C. ChievoVerona, Reggina, A.C. Siena, U.S. Città di Palermo, Udinese Calcio and S.S.C. Napoli). The acquisition of these rights marks the start of competition for sports programs with the Canal+ group. Orange offers services for video on demand access using the Orange decoder, a computer or a mobile phone. Orange offers free programming from the catalogues of available works of France Television, M6 and TF1 for one week after their initial broadcast. In 1997 France Telecom created Goa, an online entertainment subsidiary. The site is launched as a platform for players of massively multiplayer online games. In 2002 Goa acquires the operating license for Dark Age of Camelot. In 2007 Goa ceases to be a subsidiary and is merged into Orange. In 2009 Orange refocuses Goa.com on online entertainment and gradually ceases to operate massively multiplayer online games. In August 2010 goa.com disappears to become the Orange Jeux portal. Liveradio [fr]: Created by Orange in 2008, Liveradio is a free, live, on-demand IP radio streaming service. Users gain access through this service to more than 10,000 FM and web radio stations and 11,000 podcasts from 100 different countries. fixed line telephone, mainly in France and Poland. most recently, IPTV, though currently only in France and Spain, with MaLigne TV, now known as Orange TV. France Télécom merged the different internal divisions managing each platform and now all operate under the Orange brand. Orange is present in the US through its Orange Business Services division and its venture capital historical partner Innovacom as well as two R&D labs: one in Boston and the other in South San Francisco, California. 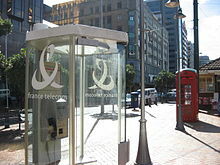 As a result of deregulation, Orange operates phone booth in Wellington, New Zealand. OpenTransit is Orange's backbone network. It covers Europe, the United States, Japan, Hong Kong, and loops back to Paris. Orange and Deutsche Telekom merged their UK businesses in 2010 to form a joint venture branded as EE. In December 2014 Orange were in talks with BT Group regarding the acquisition of EE for an estimated £12.5bn. On 5 February 2015 it was announced that BT would be acquiring EE in a £12.5bn deal, in which Orange S.A would take a 4% stake in the BT Group. The acquisition of EE was completed 29 January 2016. Globecast is a provider of transmission of satellite and production services for professional broadcast, online content and enterprise multimedia. GlobeCast World TV is a division of Globecast. In 2012, Globecast also began launching a direct to home OTT IPTV service called MyGlobeTV in the United States using NetGem set top boxes. The MyGlobeTV service was discontinued In December 2013. Viaccess Orca is a provider of IPTV and OTT TV middleware and security solutions. Orange Labs (formerly France Télécom R&D) is the research and development division of Orange. This division was derived from different previous entities, such as CNET (Centre national d'études des télécommunications) created in 1944, the CCETT created in 1972, as well as other entities. In 2007, France Télécom R&D became known as Orange Labs, a global network of R&D entities. CCETT/France Télécom R&D contributed to various international standards, such as ISO/IEC MPEG and JPEG standards or DAB and DVB standards. CCETT, IRT and Philips developed a digital audio two-channel compression system known as Musicam or MPEG Audio Layer II (Emmy Award in Engineering 2000). Two types of infrastructure coexist in Orange's research and development: the research laboratories and the technocentres. The latter are responsible for Orange innovations and consist of multidisciplinary teams of researchers, engineers, and marketing and sales personnel. On 25 January 2011 Orange announced the acquisition of 49% of Dailymotion, a French online video platform, at a cost of €58.8 million. The group also secured an option to acquire all of the shares in the platform in 2013. This is indicative of a new strategy by Orange, which seeks to offer a full range of multi-screen video to its subscribers. In late August 2010 Orange acquired an 11% share in the streaming site Deezer. With this acquisition, the operator offered its subscribers a new "Deezer Premium" option: a high-quality paid streaming music service with no advertising and 7 million titles. Created in 2007 Studio 37 [fr] co-produces and acquires films, unlike the Canal+ Group’s StudioCanal. The producer Frédérique Dumas starts the studio, which has an initial budget of 30 million Euros. For its growth, Orange negotiates exclusivity agreements with Warner, HBO, Fidélité Films and Gaumont, ensuring a stream of films for its TV Orange Cinema Series package. In 2011, Studio 37 co-produced The Artist which went on to win best picture and four further awards at the 84th Academy Awards. This makes it the first silent film to win an award since the original ceremony in 1929. Cityvox is a network of websites with local content (restaurants, cultural happenings, etc.) created in 1999. Orange purchased the network site in 2008. In January 2019 Orange acquired a minority shareholding in Aire, a credit data platform in the UK. Cloudwatt is a cloud services provider set up in 2012 by Orange (44%), the French government through Caisse des Dépôts (33%) and Thales (22%). In March 2015, Orange acquired all remaining shares of Cloudwatt to strengthen its enterprise cloud services offering. Between the beginning of January 2008 and April 2011, more than 60 France Télécom employees committed suicide, (in 2008 and the early part of 2009 there were 25 ) some leaving notes blaming stress and misery at work. In October 2009, the wave of suicides led former Deputy CEO Louis-Pierre Wenes to resign under trade union pressure, to be replaced by Stéphane Richard. Faced with repeated suicides, the company promoted Stéphane Richard to chief executive officer on 1 February 2010, while Didier Lombard remained as chairman. The suicide rate among France Télécom's 102,000 domestic employees is 15.3 per year, compared with an average of 14.7 suicides per 100,000 in the French population as a whole. Following an investigation, the Inspection du travail (Labour Inspection) told the labour union Sud-PTT that the work organisation at France Télécom "was conducive to generating suffering at work" and "health risks" for employees. An investigation was conducted by the audit firm Technologia at the request of France Télécom's management. Of the 102,843 employees in the group's parent company, 80,080 responded, i.e. a response rate of 77.9%. The fact-finding report revealed a "very poor general feeling", "strained physical and mental health", and a "tense and even violent working environment" for some categories of personnel. Working conditions were deemed difficult, mainly for personnel in charge of sales and "customer interventions". Given heavy media coverage, these findings were the source of major contention about working conditions. In 2011, following complaints by Internet users, Megaupload accused Orange of not providing sufficient connectivity to its site, thus severely limiting throughput from France, an allegation Orange denied. In November 2009, three users lodged a complaint against Orange for false advertising concerning its "Unlimited 3G Key" service. These customers criticised the operator for the misleading way in which this service is presented, since it isn't in fact unlimited. While it is true that there is no time limit, the user cannot download more than 1 gigabyte per month, thus limiting browsing. Unaware of this, the three plaintiffs browsed beyond plan limits and had to pay additional fees as a result. In March 2011, the information website OWNI uncovered a questionable financial deal that enabled the Orange group to acquire a 3G license. On 28 July 2011, the Competition Authority fined France Télécom €27.6 million for having improperly impeded the development of new competing operators in the French overseas departments (primarily Réunion). France Télécom used its dominant position, resulting in particular from its former monopoly, to take unfair advantage of its competitors. as operators of the quasi-totality of the telecommunication infrastructure local loops, making use of the data which they have access to, France Télécom has targeted former subscribers who had switched to a competitor, in order to win them back, offering them specific deals. On 1 January 2011, Orange users’ SMS and MMS were sent and billed multiple times. The operator agreed to reimburse the excess costs to consumers, explaining that the error came from a "third party operator" (which turned out to be Bouygues Telecom), said not to have sent acknowledgements, which caused the messages to be resent. A computer problem at the Bouygues platform was blamed. During the night of 31 December 2010 to 1 January 2011, more than 930 million text messages were exchanged in France (for the three operators combined), setting a new record compared with the peaks of the previous years. On 21 March 2007 Watchdog, a television series by the BBC focusing on consumer protection, published the results from a broadband survey they held. According to the survey Orange is the worst ISP in the UK. 68% of Orange customers that took part in the survey said they were unsatisfied with Orange's customer service, it was voted as the most unreliable broadband provider, and it had the highest number of dissatisfied customers. Two thirds of Orange customers experienced problems cancelling their Orange broadband. In response to the problems with Orange UK broadband and 3G broadband during March 2009 and April 2009 the 3G data network has been upgraded to 3.5G and increased signal coverage. This new network can be seen in action on many mobile phones which display network for instance the Nokia N95, when the phone detects the higher speed. The Orange UK mobile broadband USB adapter works with the new network. The 3G networks for all telecommunication suppliers still struggle to get the throughput that was originally advertised when these networks were announced. The UK Telecoms Regulator has reported on the challenges for all suppliers. A consumer organisation forum web site known as OrangeProblems.co.uk focuses on the poor level of service provided by Orange Broadband in the UK. Initially set up as WanadooProblems.co.uk, the site focuses on the infamous Orange local loop unbundling and poor customer service but covers a wider range of Orange operations such as lost email, significantly delayed SMTP and outages, suspicions of eavesdropping, et al. Orange Mobile has been criticised during a Channel 4 News investigation for a lack of security which potentially exposed customer records to fraud. In August 2007 Orange was criticised for summarily deleting email accounts tied to old Freeserve and Wanadoo 'pay as you go' dial-up accounts with no warning. In August 2008, after well publicised problems with iPhone 3G performances, customers compared their download speed and discovered that Orange in France was capping 3G download bandwidth. Orange admitted capping to 384kbit/s, well below the theoretical 7.2Mbit/s provided by the iPhone. Orange uncapped 3G and 3G+ by mid-September 2008. The French chairman and CEO of the Orange telecommunications company, Stéphane Richard said in Cairo regarding his company operations in Israel, "Believe me, I would cancel the contract tomorrow if I could. We want to end this and to fix this; we don't want it." Later, Orange announced its desire to discontinue use of its popular brand name by its Israeli operator Partner Communications Company. The president of the State of Israel Reuven Rivlin said in response "Just yesterday Israel faced attacks from anti-Israel and anti-Semitic bodies, who have chosen to delegitimize the state of Israel, and to launch rockets at us from the Gaza Strip. We must face these challenges together, right and left," Rivlin said. Israeli culture minister Miri Regev said, "I call on Jews of France and the world to disconnect from Orange unless Stéphane Richard takes back his words. The time has come for them to understand that Jews in the world and sane voices that oppose anti-Semitism and racism also have power." The statement on the company's website announced in response that "The Orange Group is a telecoms operator and as such its primary concern is to defend and promote the value of its brand in markets in which it is present," the statement began. "The Group does not engage in any kind of political debate under any circumstance." Later, Richard visited Israel to clarify his remarks. He met Israeli PM Benyamin Netanyahu and former president, Shimon Peres. Richard told both Netanyahu and Peres that Orange has not and will not support anti-Israel boycott efforts, and insisted that its announced decision to abrogate its relationship with Partner was purely commercial and not political. On 30 June 2015, Orange and Partner announced a change to their 10-year licensing agreement. Orange paid Partner €40 million to add an opt out clause to the contract, with which Partner conducted a market survey which is determine the best course of action moving forward. In the first year only Partner can opt out, with either party being able to opt out in the second year. Regardless of which party opts to exercise the out clause, Orange will pay Partner an additional €50 million to end the arrangement. Orange stated that the money paid to Partner was purely for re-branding purposes and affirmed their previous statement that their wish to leave Israel is based on desire to discontinue license agreements and maintain only subsidiaries that they control, rather than a boycott. Orange would make the relevant payments over the course of two years and charge it to their books as a mix of marketing, sales, customer services and related expenses. As part of the agreement Orange's research and development activities within Israel would transition to the Orange name, but would be restricted from entering the telecommunications services market. In September 2015, Orange reaffirmed their commitment to Israel with an investment in Hola, a video distribution network. In February 2016, Orange and Partner decided to terminate their agreement. As a result, rebranding has resulted in Orange Israel becoming part of Partner. Audit Committee: Created in 1997, the Audit Committee comprises three members appointed for indefinite terms by the board of directors on the recommendation of the Governance and Corporate Social Responsibility Committee. Governance and Corporate Social Responsibility Committee: Created in 2010, it comprises at least three members appointed by the board of directors on the recommendation of its chairman. Its remit is to examine the main risks and opportunities in relation with the environment, Orange's policies concerning industrial, the publication of societal and environmental information, and the main orientations of its corporate social responsibility policy. Strategy Committee: Created in 2003, the Strategy Committee comprises at least three members appointed by the board of directors on the recommendation of its chairman. The latter chairs the committee. It examines the group's international development strategic and the strategic mid-term guidelines. The company is headed either by the chairman of the board of directors, whose title in that case is the chairman and chief executive officer, or by another person appointed by the board of directors and given the title of chief executive officer. The Orange group is governed by a board of directors composed of a minimum of twelve members and a maximum of twenty-two members, divided as follows: three are appointed by the French State, three are elected by the employees, one is elected by the shareholders and represents employee shareholders, the fifteen other members are appointed by the shareholders. The board members serve for a term of four years. The executive committee reports to the chairman and CEO. Its purpose is to coordinate the implementation of Orange's strategic orientations and to oversee the achievement of operational, social, technical and financial resource allocation objectives. It comprises fifteen members. Orange's former head office in Paris at 6, Place d'Alleray. Orange's head office, since 2012, is based at 78, Rue Olivier de Serres in the 15th arrondissement of Paris. The company's former head office was based at 6, Place d'Alleray in the 15th arrondissement of Paris. The building was the head office from 1998 until 2012. Eight hundred employees worked at the site. In 1987 France Telecom established the France Telecom Foundation. On 16 January 2007, the foundation changed its name to Orange Foundation. In 1990 France Telecom Foundation received the top award for corporate philanthropy from ADMICAL. In 1995 France Telecom Foundation received the top award for solidarity from ADMICAL. The board of directors of Orange Foundation consists of representatives of Orange, independent personalities and employee representatives. Its purpose is to support projects related to health, particularly autism; education, particularly schooling for girls in developing countries; and culture, particularly group vocal music. Projects supported by Orange Foundation are chosen by committees of experts devoted to each major theme. The Foundation has been involved in 300 to 400 projects per year since 1987. The Foundation works with international NGOs and local associations involved in long-term projects in countries in which Orange is based for better follow-up of these projects. From 2000 to 2002, Orange was a major sponsor of Leafield-based Formula One team Arrows. The company was the official jersey sponsor of the national basketball teams of the Central African Republic and Senegal at the 2015 FIBA Africa Championship. Since October 2017, Orange is the new kit sponsor of the French soccer team of Olympique de Marseille for the seasons 2017/2018 until 2018/2019. ^ 4-traders. "ORANGE SA company : Shareholders, managers and business summary". ^ "Get to know us better". Orange Jobs. Retrieved 7 August 2013. ^ "Annual Results 2012" (PDF). France Télécom. 20 February 2013. Retrieved 7 August 2013. ^ a b "France Telecom to become Orange on 1 July 2013". Orange. 28 May 2013. Archived from the original on 24 September 2015. Retrieved 14 July 2013. ^ Chrisafis, Angelique (28 June 2012). "France says farewell to the Minitel – the little box that connected a country". The Guardian. ISSN 0261-3077. Retrieved 11 January 2018. ^ "Shareholding structure". France Telecom. Archived from the original on 1 February 2013. Retrieved 6 April 2009. ^ "Esmertec Welcomes Michel Bon, Former CEO and Chairman of France Telecom, to its Board". Retrieved 11 January 2018. ^ "The Facts : 2004" (PDF). na.baesystems.com. p. 107. Archived from the original (PDF) on 25 January 2007. Retrieved 9 June 2012. ^ "Vodafonews est un site non officiel de Vodafone". Vodafonews.com. Archived from the original on 24 May 2013. Retrieved 29 April 2013. ^ a b "BAe's record-breaking sterling Eurobond issue" (PDF). 22 June 1999. Retrieved 9 June 2012. ^ "Hutchison Whampoa Releases Annual Results 1996". 26 March 1996. Retrieved 9 June 2012. ^ "Telecommunications - Hutchison Whampoa". 1996. Retrieved 9 June 2012. ^ "Mannesmann to buy UK cellular firm; Vodafone, Hutchinson likely to react". CNN. 21 October 1999. Retrieved 9 June 2012. ^ "Mannesman to buy Orange for $33bn". New York Times. 21 October 1999. Retrieved 26 December 2008. ^ "$36B Orange consumed". CNN. 21 October 1999. ^ "Vodafone seals Mannesmann merger". BBC. 11 February 2000. Retrieved 26 December 2008. ^ "France Telecom buys Orange for $37 bn". The Financial Express. 30 May 2000. Archived from the original on 22 May 2013. Retrieved 9 June 2012. ^ "France Telecom clinches Orange deal". BBC. 30 May 2000. Retrieved 9 June 2012. ^ "TELECOMS : France Télécom boucle le rachat d?Orange - LExpansion.com". Lexpansion.lexpress.fr. 22 August 2000. Retrieved 29 April 2013. ^ "Video [Introduction Orange en bourse] notice archives video" (in French). Ina.fr. Retrieved 29 April 2013. ^ "OPA sur Orange et Wanadoo : les petits porteurs sont en colère". Silicon.fr. 24 February 2004. Retrieved 29 April 2013. ^ "Orange IPO on Euronext" (PDF). ^ Ruitenberg, Rudy (27 February 2005). "France Telecom Names Lombard Chief Executive, Replacing Breton". Bloomberg. Retrieved 6 April 2009. ^ "Mid Europa Announces Agreement for The Sale of Orange Austria to Hutchison 3G Austria". 3 February 2012. Retrieved 7 August 2013. ^ "Le torchon brûle entre Orange et Canal+ Orange FAI". Echos du Net. Retrieved 29 April 2013. ^ Babamanga. "Les futures séries de HBO sur Orange". TV Chronik. Retrieved 29 April 2013. ^ ARIASE. "VoD : Orange et MGM signent un accord". Ariase.com. Retrieved 29 April 2013. ^ "Football - MAXIFOOT : Droits TV : Orange remporte la seconde manche". Maxifoot.fr. 16 May 2009. Retrieved 29 April 2013. ^ "Orange suspend la commercialisation d'Orange Sport" (in French). Capital.fr. 25 April 2013. Archived from the original on 10 December 2014. Retrieved 29 April 2013. ^ Gow, David (1 July 2008). "TeliaSonera: France Télécom hangs up on Swedish operator". The Guardian. Retrieved 9 April 2009. ^ "Orange brings iPhone to customers in Europe, Africa and the Middle East". Orange. 16 May 2008. Retrieved 20 May 2006. ^ "Comparateur MonPetitForfait - Trouvez le forfait mobile idéal". Monpetitforfait.com. 22 February 1999. Retrieved 30 March 2017. ^ "T-Mobile and Orange in UK merger". BBC News. 8 September 2009. Retrieved 2 May 2010. ^ "Orange Armenia Official Website". ^ "Le président de France Télécom tire sa révérence". Lefigaro.fr. 20 January 2011. Retrieved 29 April 2013. ^ "Christine Albanel rejoint France Télécom". Lefigaro.fr. 19 February 2010. Retrieved 29 April 2013. ^ "Orange's successful broadband outsourcing". Choose.net. 21 October 2011. Retrieved 29 April 2013. ^ "Didier Lombard quitte définitivement France Telecom - TÉLÉCOMMUNICATIONS". FRANCE 24. 2 March 2011. Retrieved 29 April 2013. ^ "Polémique autour du placard doré de Didier Lombard - LExpansion.com". Lexpansion.lexpress.fr. 24 February 2011. Retrieved 29 April 2013. ^ "Hutchison to buy Orange Austria as it seeks expansion". BBC News. 2 March 2012. Retrieved 31 August 2013. ^ Shields, Michael (3 January 2013). "Hutchison Whampoa closes acquisition of Orange Austria". Reuters. Retrieved 31 August 2013. ^ Prodhan, Georgina (19 August 2013). "Hutchison keeps rock-bottom tariff after Orange Austria buy". Reuters. Retrieved 31 August 2013. ^ "France Telecom Buys Egypt's Mobinil". Nuqudy. 29 May 2012. Retrieved 31 August 2013. ^ "Orange strikes 3.4 billion euro deal to buy Spain's Jazztel" (Press release). Reuters. 15 September 2014. ^ "Les participations publiques" (in French). Agence des participations de l'État. 30 April 2015. Retrieved 21 February 2016. ^ "2015 Consolidated financial statements" (PDF). Orange S.A. 16 February 2016. Retrieved 21 February 2016. ^ "Orange". NYSE Euronext. Archived from the original on 15 June 2013. Retrieved 21 June 2013. ^ "Parts de marché : opérateurs de téléphone mobiles en France | iPhone Killer". Retrieved 29 April 2013. ^ "Salt Mobile - We used to be Orange. We are now called Salt". Salt.ch. Retrieved 15 January 2016. ^ Libeskind, Kalman (2 January 2016). תום העידן הכתום: פרטנר תיפרד מהמותג אורנג' - כבר בפברואר [End of the Orange Era: Partner to Part With the Orange Brand] (in Hebrew). TheMarker. ^ "Stratégie "Content Everywhere" d'Orange : Cinéma sur les trois écrans". Servicesmobiles.fr. Retrieved 29 April 2013. ^ "Orange : programmes de France Television en VOD". Clubic.com. 2 July 2007. Retrieved 29 April 2013. ^ "M6 Replay accessible sur la TV d'Orange". 01net.com. 1 January 2012. Retrieved 29 April 2013. ^ "MyTF1 arrive chez Orange le 7 Juin (ADSL et Sat) | Orange Info". Orangeinfo.fr. Retrieved 29 April 2013. ^ "Wanadoo is to make way for Orange". BBC News. 29 June 2005. Retrieved 6 April 2009. ^ Clark, Nick (12 May 2010). "Mobile giants promise Everything Everywhere". The Independent. London. ^ Simon Goodley and Juliette Garside. "BT in talks to buy mobile phone operator EE for £12.5bn". The Guardian. London. Retrieved 15 January 2016. ^ "GlobeCast Announces Commercial Launch of MyGlobeTV". GlobeCast. 1 July 2012. Archived from the original on 11 March 2013. Retrieved 21 June 2013. ^ Hunter, Philip (9 July 2012). "MyGlobeTV 'closed OTT' service launches in U.S." Broadcast Engineering. Retrieved 21 June 2013. ^ "GlobeCast to pull plug on MyGlobeTV IPTV service". Rapid TV News. Retrieved 15 January 2016. ^ "Bienvenue au CNET – centre de R&D de France Télécom (archived website)". 1996. Archived from the original on 22 December 1996. Retrieved 3 August 2010. ^ "CNET – a half century of innovation (archived website)". 2008. Archived from the original on 12 June 2008. Retrieved 3 August 2010. ^ "Expanding the offer of France Telecom and TDF (archived website)". 20 April 2001. Archived from the original on 20 April 2001. Retrieved 1 August 2010. ^ "CCETT – Joint Research Center for Broadcast and Telecommunications (archived website)". 1997. Archived from the original on 3 July 1997. Retrieved 1 August 2010. ^ "EBU Technical Review – Digital Audio Broadcasting (DAB)". 2001. Archived from the original on 20 January 2012. Retrieved 1 August 2010. ^ Olivier Corredo (19 January 2007). "France Telecom R&D devient Orange Labs". Retrieved 1 August 2010. ^ "CCETT – Welcome to the CCETT's MPEG Audio Web Site (archived website)". 1997. Archived from the original on 14 April 1997. Retrieved 1 August 2010. ^ Leonardo Chiariglione (6 September 2009). "Riding the Media Bits – MPEG's third steps". Archived from the original on 22 January 2011. Retrieved 11 August 2013. ^ Leonardo Chiariglione (17 March 2005). "VADIS FINAL PROJECT REPORT". Archived from the original on 25 July 2011. Retrieved 11 August 2013. ^ "STERNE: the CCETT proposal for digital television broadcasting". 1992. Retrieved 1 August 2010. ^ "DVB Project – List of Members – TDF". Retrieved 1 August 2010. ^ "Monitoring research 11 September 97 – Analysis; What's new on the DAB front?". BBC Monitoring. 11 September 1997. experiments aimed at mobile receivers were first carried out by France's Centre Commun d'Etudes de Telediffusion et Telecommunications (CCETT) in 1984. ^ "CCETT – DAB : Digital Audio Broadcasting (archived website)". 11 February 2001. Archived from the original on 11 February 2001. Retrieved 1 August 2010. ^ "Document de Référence 2010 - p.286" (PDF). France Télécom. Archived from the original (PDF) on 17 February 2012. Retrieved 11 August 2013. ^ "La force de la recherche et du développement" (in French). Orange. Archived from the original on 28 March 2012. Retrieved 11 August 2013. ^ "Une étroite collaboration avec le monde académique" (in French). Orange. Archived from the original on 28 March 2012. Retrieved 11 August 2013. ^ a b "Orange prend 49 % de Dailymotion". lemonde.fr. 25 January 2011. ^ "Orange prend 11% du capital de Deezer - LExpansion.com". Lexpansion.lexpress.fr. 27 August 2010. Retrieved 29 April 2013. ^ "Cinéma : L'appétit d'Orange - L'EXPRESS". Lexpress.fr. Retrieved 29 April 2013. ^ "France TĂŠlĂŠcom s'offre Cityvox - Le Nouvel Observateur". Tempsreel.nouvelobs.com. 23 June 2008. Retrieved 29 April 2013. ^ "Orange invests in Aire, an innovative fintech company" (Press release). Paris: Orange. 8 February 2019. Retrieved 8 February 2019. ^ "Orange acquires the totality of Cloudwatt" (Press release). Paris: Orange. 20 March 2015. Retrieved 24 March 2015. ^ "Selbstmordserie: France Telecom Mitarbeiter verbrennt sich". Der Spiegel. 27 April 2011. ^ Drummond, Norman (2010). The Power of Three: Discovering what really matters in life. London: Hachette (Hodder & Stoughton). p. 13. ISBN 9780340979914. ^ "France Telecom talks with unions on suicide spate". Reuters. 7 October 2009. ^ Chrisafis, Angelique (9 September 2009). "Wave of staff suicides at France Telecom". The Guardian. London. Retrieved 2 May 2010. ^ Campbell, Matthew (1 February 2010). "France Telecom Names Richard CEO; Lombard to Remain Chairman". Business Week. Archived from the original on 5 February 2010. Retrieved 11 August 2013. ^ Sage, Adam (23 September 2009). "Why are France Télécom employees committing suicide?". The Times. UK. Retrieved 6 October 2009. ^ France Télécom: la souffrance au travail est établie sur le site NouvelObs.com, 10 December 2009. ^ Orange visé par une plainte pour publicité mensongère sur le site NouvelObs.com, 22 December 2009. ^ "Ben Ali: les compromissions d'Orange en Tunisie". Owni.fr. Retrieved 29 April 2013. ^ Les SMS ou MMS envoyés la nuit de la Saint-Sylvestre paru dans l'Assistance Mobile d'Orange sur Internet. ^ "Bug des SMS du Nouvel An : Orange met Bouygues Telecom en cause". 01net.com. 1 January 2012. Retrieved 29 April 2013. ^ Article « Comment les opérateurs expliquent le «bégaiement» de textos » paru le 3 January 2011 sur le site Internet du quotidien Libération. ^ Article « Plus de 930 millions de SMS envoyés pour le Nouvel An » paru le 3 January 2011 sur le site Internet du quotidien Libération. ^ "BBC Watchdog Broadband Survey". Archived from the original on 27 March 2007. Retrieved 21 March 2007. ^ "Ofcom". Archived from the original on 27 March 2010. Retrieved 10 September 2009. ^ "Night of the long juicer"
^ a b "Orange Exec Pleads for BDS Pity, Hopes to Cut Ties with Israel". The Jewish Press. Retrieved 15 January 2016. ^ "Orange confirms it plans to cut ties with Israeli firm, but says move not political". Jerusalem Post. Retrieved 15 January 2016. ^ a b "Netanyahu: French Govt. Partially Owns Orange". Israelnationalnews.com. Retrieved 15 January 2016. ^ Keinon, Herb. "Benjamin Netanyahu to France: Renounce the miserable actions of Orange". Jerusalem Post. Retrieved 15 January 2016. ^ "Netanyahu calls on French govt to publicly denounce Orange's pullout from Israel". I24news.tv. 4 June 2015. Retrieved 15 January 2016. ^ Surkes, Sue. "Orange CEO sows confusion on Israel trip aimed to resolve dispute". The Times of Israel. Retrieved 15 January 2016. ^ Reuters (17 February 2016). "Israel's Partner Rebrands, Cuts Final Ties With Orange". Haaretz. Retrieved 2 July 2017. ^ "Corporate Website of France Telecom-Orange". Orange.com. 24 April 2013. Retrieved 29 April 2013. ^ "Group's General Management Committee". www.orange.com. Retrieved 28 March 2019. ^ "Legal matters". Orange. Archived from the original on 9 September 2013. Retrieved 7 August 2013. ^ "Legal matters". France Télécom. Archived from the original on 29 May 2012. Retrieved 7 August 2013. ^ "France Télécom : un legs de l'administration" (in French). Le Journal du Net. 27 June 2007. Retrieved 8 July 2010. ^ a b "Carrefour du Mécénat d'entreprise". Admical. Retrieved 29 April 2013. ^ "Naissance de la Fondation Orange". Generation-nt.com. Retrieved 29 April 2013. ^ 2015 FIBA Africa Championship - Senegal, FIBA.com, Retrieved 11 May 2016. ^ "Orange devient le partenaire majeur de l'Olympique de Marseille". Retrieved 14 October 2017. Cite error: A list-defined reference named "Composition du comite executif Orange" is not used in the content (see the help page). Cite error: A list-defined reference named "Orange renforce sa gourvernance" is not used in the content (see the help page). Cite error: A list-defined reference named "Orange droits serie A foot italien" is not used in the content (see the help page). Wikimedia Commons has media related to Orange S.A.. This page was last edited on 13 April 2019, at 20:23 (UTC).